ABILENE-- Beatrice Margarete "Tats" Childres, 94, went home to be with her Lord and Savior Tuesday, July 2, 2013. Visitation will be from 6:00 to 8:00 p.m. Friday at Starbuck Funeral Home (Merkel). Graveside services will be 10:00 a.m. Saturday, July 6th in the Tuscola Cemetery with Reverend Mike Reed officiating. 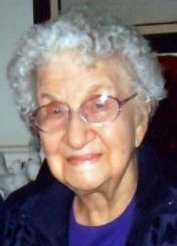 Beatrice was born December 21, 1918 in Childress County to Millard Filmore and Margaret Jane (Coley) Self. She married James Raymond "Slim" Childres January 2, 1943. They lived most of their married life in Ovalo, Sweetwater, Trent and Abilene. She was a member of Southwest Drive Methodist Church. She worked many years for Times. Survivors include one son, Bobby Yoes and wife Tenna of Buffalo Gap; two daughters, Janie Heathly and husband Kenneth of Abilene and Mary Mead of Fair Oaks Ranch; a son-in-law, Arley Doby of Abilene; three granddaughters; six great grandchildren; and numerous nieces and nephews. She was preceded in death by her parents; her husband; daughter, Martha Doby; brother Hilbun Self; and sisters; Eva Best and Wilma Wilder.